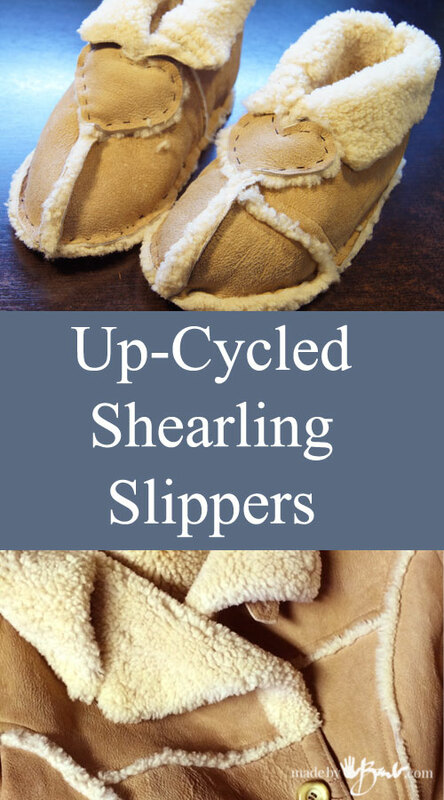 If you have ever had a pair of REAL shearling/sheepskin slippers, then you know the true heaven that your feet feel! ‘Ask any Uggs owner. There is absolutely no substitute! When I see an old Sheepskin coat go to waste, it really pains me, as some poor animal has already paid the ultimate price. 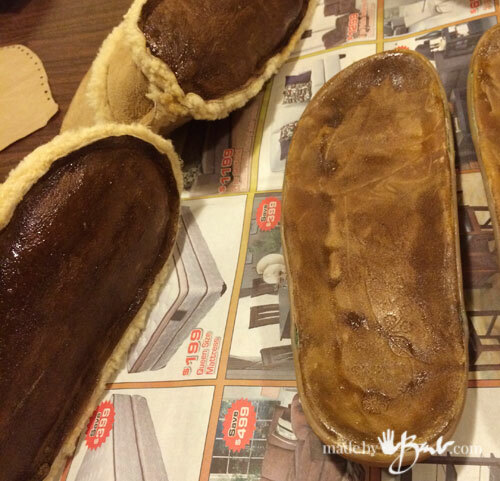 It gives me much pleasure DIY’ing and revamp it and make my old aching feet some comfy slippers. As for the pattern, I have a size 9 womens foot. Click the image below to download the PDF file. For scale, see the 1 inch markings. 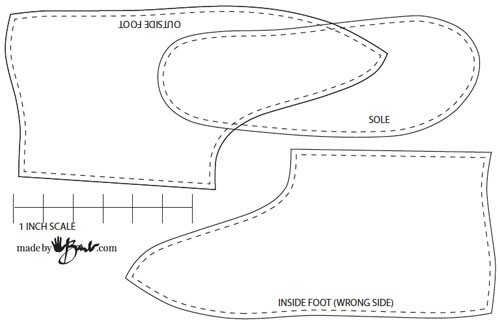 If you have a smaller size, you could take the back seam in and shorten the sole. Fit will depend on thickness of fur as well, so I usually do a bit of a baste test fit. You can cut off, but can’t add. You do have options of how to sew the pieces together. 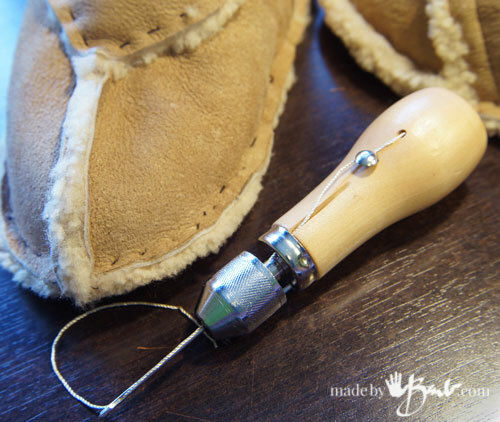 An awl can work, as also a basic needle and thread. I would use a thimble to save your finger tips though. Notice that my stitching is somewhat coarse, again adding to the handmade charm. 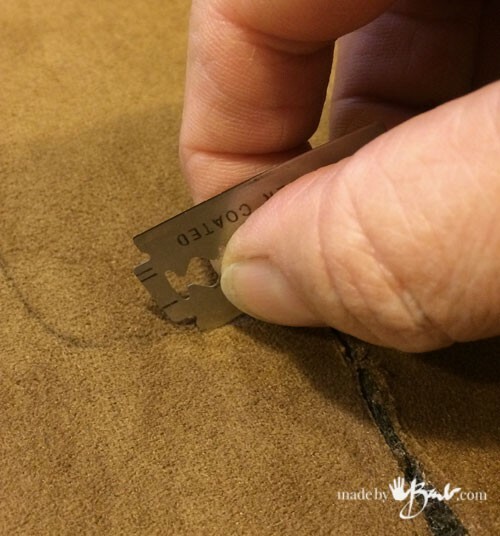 In most cases a good sewing machine can handle the shearling since it is usually quite soft. You may want to squeeze the seams together and just let the fur spread out of the seam. 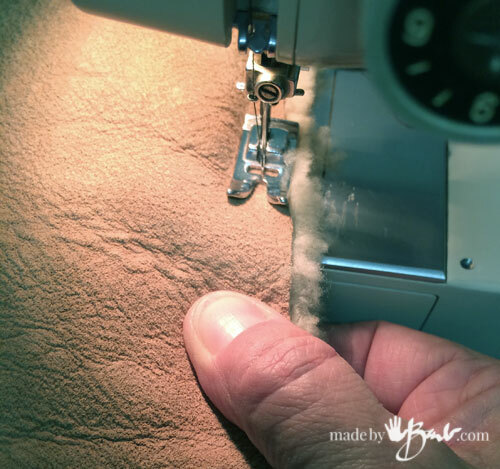 Make sure the machine stitches are not too close as this will weaken the leather and make it rip along the many holes the needle is making. 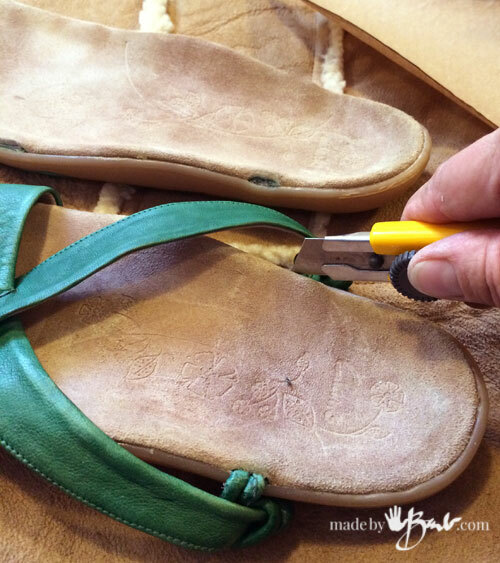 Use bulldog clips or small clamps to centre sole on sides. 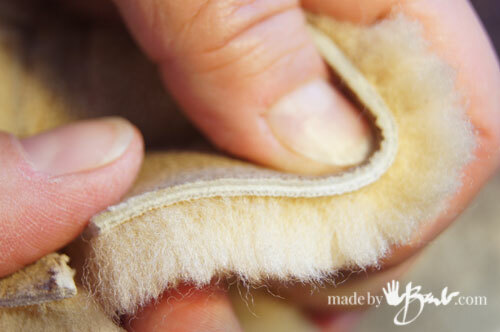 Sew around sole (tight curves are difficult, so I prefer to handstitch the sole. Ease along to make it fit. 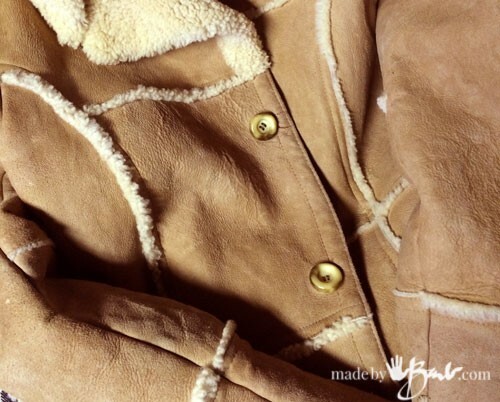 Shearling is forgiving but also has some stretch. Soooo, I used a pair of sandals that were on the way out, but had great soles. I cut the straps off and they fit the bottom shape well. 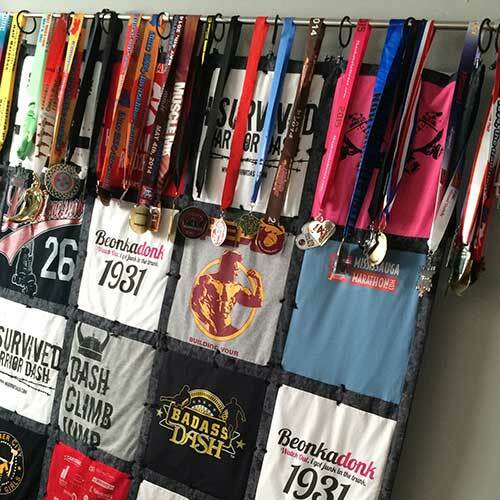 You could also use some rubber matting or flipflops. Contact Cement is quite smelly but one of the only glues that has the strength. Just be careful to ventilate well. Apply liberally to both surfaces and let dry. Once dry, line up properly and attach. Here they are attached. And worked quite well. 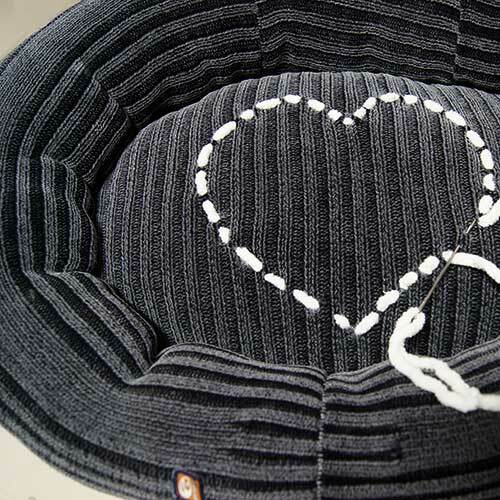 The button also came from the coat and my usual “heart” went into/on it! I am sure the poor sheep would be happy not to be in the landfill. “For the LOVE of sheepskin!” Baaa, thank you! Tootsies enjoy! 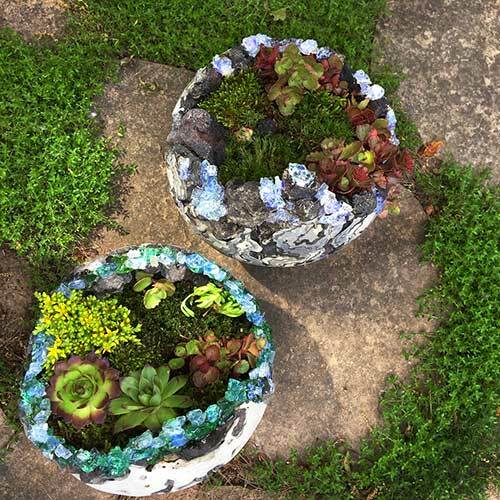 Another awesome project. Photos and instructions look very easy to follow. I love how you said that true heaven for you feet is sheepskin slippers! My mom has always loved wearing slippers around the house and she always seems to cold. I’m sure that if she had a pair of really nice handmade sheepskin slippers she would feel a lot more comfortable.